Colorado ski areas got a fresh coating of new snow overnight Monday into Tuesday, allowing Copper Mountain to crank up snow guns along Upper Andy’s and Copperopolis trails. 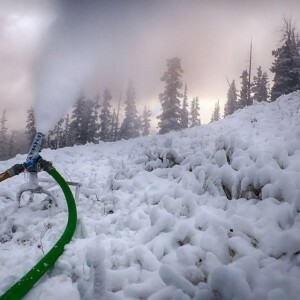 Snowmaking at Copper Mountain on Tuesday, Sept. 30 (Copper Mountain photo). Copper, which saw more than two inches of new snow overnight, is scheduled to open to the public for the season on Friday, Oct. 31. U.S. Ski Team athletes will start training before then on the U.S. Ski Team Speed Center at Copper Mountain in preparation for the 2015 FIS Alpine World Ski Championships to be held at Beaver Creek in February. Copper once again will introduce the full roster of Olympic medalists and World Champion alpine skiers while hosting the First Tracks Alpine Team Naming on Saturday, Nov. 8. Arapahoe Basin officials on Tuesday were still weighing the merits of starting snowmaking operations, saying temperatures and humidity were both a little high. A-Basin won the race to open first in Colorado the last two seasons by cranking up its lifts on Oct. 13 last year and Oct. 17 the year before. Loveland followed closely behind on Oct. 17 and Oct. 23. Keystone also opens on Halloween, Friday, Oct. 31, followed by Breckenridge and Wolf Creek (tentatively) on Friday, Nov. 7, Vail on Friday, Nov. 21, and Beaver Creek the day before Thanksgiving on Wednesday, Nov. 26. Aspen Mountain and Snowmass are both set to open on Thanksgiving Day, Nov. 27.